Looking for the best way to trap opossums in 2019? Then you've come to the right place! We reviewed five different traps, but the reliable Havahart Trap was our clear favorite, and for good reason: it's a solid, durable cage that traps opossums the right way. This trap is constructed from a rust-resistant steel and ships to customers in a collapsed state, totally pre-assembled. There's no building required—simply pull open the box and you've got yourself a durable trap that's ready to work its magic in the backyard on your opossum infestation. Here's how the trap works: a small piece of bait is placed on a spring-loaded platform in the back of the trap. Once the opossum makes its way inside and steps on the platform to retrieve the bait, the spring activates. This snaps the door closed behind the animal. It's trapped inside and unable to escape, but kept alive and fully able to breathe and move until you can set it free or handle it any way you choose. This device works to confine opossums as well as raccoons, feral cats, chipmunks, squirrels, rodents, and other nuisance animals that wreak havoc in your yard! We've got several other opossum traps broken down below, as well as a few key facts on how to use these traps and what to do with the opossum once you've caged it. What Is an Opossum Trap? What Should I Do With My Trapped Opossum? When Should An Opossum Trap Be Set? While there are no specific traps that are specially marketed for opossums, there are a few different traps made for larger-sized nuisance animals like raccoons, feral cats and—you guessed it—opossums. Generally, these traps work by using spring-loaded mechanisms attached to the baiting platforms. However, the jargon in the product descriptions can get a little confusing, so keep reading below. We'll break down what this means and shed a little insight on how these traps work. Essentially, each trap is a giant metal rectangle made of steel bars meshed together. On the inside, there is a platform which is attached to a spring. This spring also connects to the door. The purpose of this platform is to hold bait in order to lure an opossum into the trap and onto the platform, where its weight will activate the spring. Once the spring is tripped, the door will snap shut, trapping the animal inside. What Stops the Opossum from Escaping? Because the door is snapped shut from the outside, it's nearly impossible for an animal trapped inside to escape. The galvanized steel design of most traps prohibit tampering with the door from the inside, and usually, the nuisance animal on the inside simply isn't strong enough to push open the door to the trap. More often than not, these animals are much too scared and confused to even attempt to tamper with the trap, and will wait until they are set free. Will Trapping a Live Opossum Only Agitate It? While any animal trapped in a confined space will become agitated and scared, rest assured that a caged opossum poses no significant danger to humans. It's highly unlikely that opossums are able to carry rabies, despite the catatonic state they appear to slip into when they become scared. In fact, an opossum in captivity may even appear to be dead—these animals have popularized the term "playing 'possum" due to their tendency to slow their heart rates and go limp for periods of time. Take a look at how docile this opossum becomes when caught in a trap (and how nicely it exits the trap when freed) in the video below. Before you get down to trapping opossums, make sure you understand the protections in place for these animals. Depending on where you live, it may be against the law to release these animals back into the wild without a permit from your local government. Trapping a live opossum on your own property is generally regarded as legal, but relocating it back into a separate wild location is against mostly illegal in many areas. For more details on your specific zoning ordinances, check with your local government's wildlife division. There are currently no poisons on the market directed toward opossums, and using a rodenticide or antifreeze in order to kill an opossum can come with serious legal consequences. However, some states permit the use of firearms to eradicate opossums. If you're not sure whether or not it's legal to use your gun to discharge an opossum, check with your local wildlife division for up-to-date legal status. However, think twice before killing an opossum! Not only are they harmless creatures, but they are actually pretty beneficial to have around. Check out this video for some of the fascinating ways opossums help the world around them. They don't just lay around and eat bugs—they're actually helping to stop the spread of Lyme Disease! Laws and protections for opossums vary from place to place, sometimes as low as the county level. If you're unsure of where to begin, you can always start at the federal level and work your way down. The US Fish and Wildlife Service has a state directory tool which can help funnel you to the area where you live. By using this tool, you can get a phone number or an email address to someone who can give you more information on the laws regarding opossum release and killing for your area. Remember: the laws are very specific for each and every area, and we recommend that you find out which law applies to your area BEFORE purchasing an opossum trap. Because opossums are nocturnal animals, setting bait in your trap before you go to bed is the best idea. This way, the bait will be as fresh as possible during the night time—otherwise known as prime prowling time for an opossum. Also, be sure to set the trap in dark, secluded corners of your backyard or garden. True to their demeanor, the opossum will want to hide out in a creepy place; not necessarily out in the open. Try to set up the trap near garbage bins or under awnings—somewhere secluded that the shy opossum believes it can be left alone. Havahart is one of the leaders in humane animal traps, and their Live Animal One-Door Trap is no exception to their classic style. This is a deluxe trap with two separate entrances for an opossum to crawl inside. This also means that there are two different ways to release the opossum (or any other animal) back into the wild. One aspect that we really like about this trap in particular is that its trigger rod sits on the outside, meaning that the animal can't interfere with it from the inside. This creates a much more stable and effective trapping experience, despite being such a small detail. Being a big name brand, Havahart's product will run a little more expensive than the other recommended traps on the list, which is why we rank it so close to the bottom. In terms of effectiveness, this trap is not to be beaten. In addition to its high esteem and sterling reputation, Havahart offers a one-year warranty on this trap. What makes this opossum trap different from the others on the list (and our runner-up) is its new spin on an old idea. Most traps out there operate by the usual spring-loaded door plate mechanism, but the Amagabeli Professional Humane Live Animal Trap works a little differently. This trap uses a hook system (much like that of a fishing pole) in the middle of the trap on which the bait hangs, luring in the opossum. Once the opossum makes its way inside, there's a trigger mechanism that snaps the door shut, just like that of a spring-loaded trap. 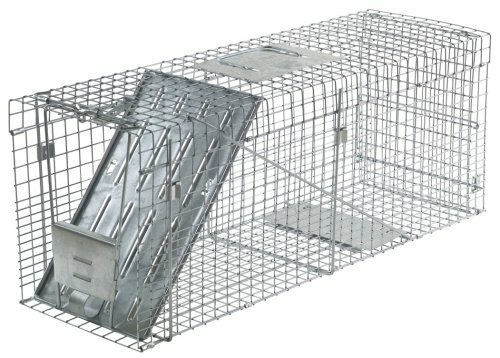 The trap itself is made from rust- and corrosion-resistant galvanized steel which is designed for long-term durability. Each trap comes with a three-year warranty from the manufacturer in the event of damage. 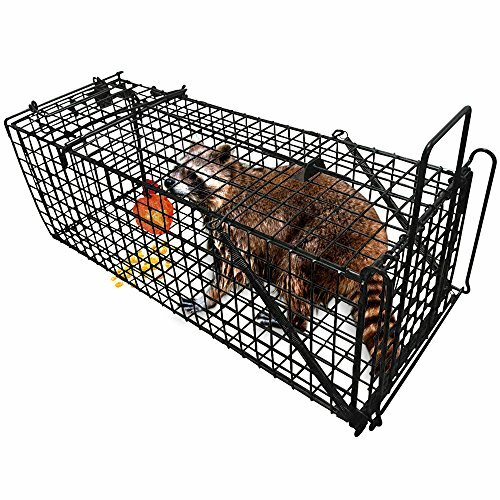 We endorse this trap for those who have a combination of large nuisance animals on their property which need trapping, as this trap is designed to take on bigger animals that may not normally crawl into tinier cages. 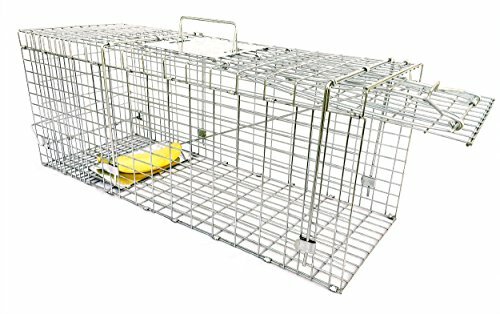 The ZENY Live Animal Cage Trap is an ideal solution for those who are looking for a budget option to trap a variety of different nuisance animals in the yard, including opossums. This trap works using the standard spring-loaded door model. The bait sits on a platform which is attached to the spring on the door, snapping it closed when weight is applied. What we love about this particular trap is that it works to get the job done without the price inflation of some of its competitors. This is a great budget option for those who don't want to spend an arm and a leg on a trap, or perhaps those who don't have a lot of nuisance animals to trap in the first place. The Large Collapsible Humane Live Animal Trap from Ranger Products is perfect for those who have oversized animals prowling around the backyard but are starved for space in the garage. 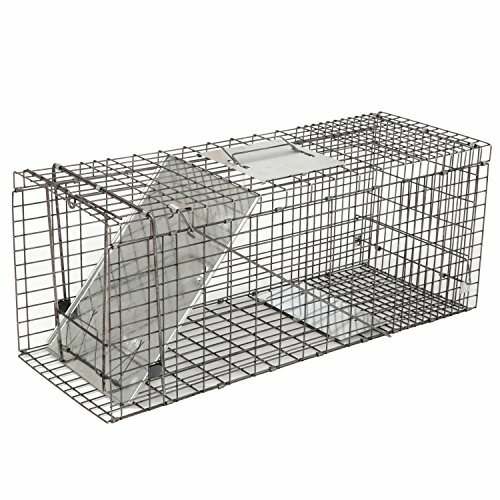 This trap is made from galvanized steel for long-lasting durability, and folds up for seamless storage while not in use. When it's time to trap an opossum, the trap easily unboxes itself and gets to work luring in opossums, raccoons, feral cats, and other intruders you don't want in your yard. While there is some assembly required after shipment, the manufacturers are Ranger Products also include a video to help with the setup process. We recommend this trap to those who need to trap large animals but don't have a ton of space to spare while the trap isn't in use. People are going to have different reasons for getting rid of opossums, but one thing is clear: these nuisance animals need to go. Curious about other opossum related products? Check out our other detailed guides to help you deal with your pest problems.